Being an intern in New York City is hard. So let us make things a little easier. Here’s where you should be eating all summer. When the lights went out and the water came flooding, we couldn’t help but wonder if this could be it. If Sandy were to permanently conquer lower Manhattan, what would we have missed the most? A bagel with belly lox, cream cheese, tomato and capers from Russ & Daughters, the LES institution of smoked fish and Jewish “appetizers” that’s been around since 1914. You know a place is the real deal when it’s equally beloved by the old guard of Jewish immigrants as it is by their children and their children’s children. And it ain’t just us Jews. Everyone loves a good bagel and lox. It’s a New York tradition. We usually don’t review bagel joints. Sure, we’ve got plenty of love for H&H; (RIP), Murray’s and Ess-a-bagel, but you won’t find them on The Infatuation. 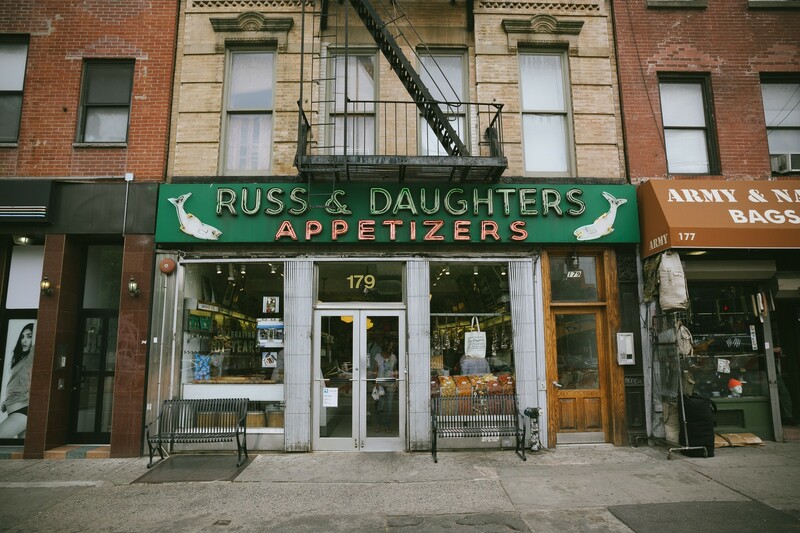 Russ & Daughters isn’t your typical bagel place. This is a smoked fish museum of deliciousness that people come from near and far to experience. The guys behind the counter, most of whom have been there for decades, are professional sandwich makers. There’s an art form to it, so don’t rush them. The way they hand cut the Nova, smear the homemade cream cheese, angle the tomato, thinly slice the onion, and finish it off with a couple capers takes dedication and focus. You can taste the love in every bite. Take a number, find a small crevice of available real estate, and wait your turn. Try and avoid accidental tuchus contact with an old Yenta and keep your eyes peeled for A-list celebrity sightings. You never know who you might run into. Everyone hastheir signature order here, as discussed above, ours includes a plain bagel,salty, not fishy, belly lox, cream cheese, tomato, onion and capers. The best.However, all of their sandwiches are incredible. Feel free to craft your own bagel or mess around with a Fancy Delancey (Smoked Tuna with Horseradish DillCream Cheese and Wasabi Flying Fish Roe) or a Pastrami Russ (Pastrami-CuredSalmon with Sauerkraut and Mustard), both of which are excellent. There are so many options, it’ll make your head spin. We’re not properly qualified in smoke fish speak to offer up lessons on what all 30 of their Smoked/Cured fish options, but we can of course toss out some suggestions. We’re huge fans of the Pastrami Cured Salmon. Incredible smoked salmon with a pastrami crust? It doesn’t get much better. The Pickled Lox with Onions doesn’t belong on a bagel, it belongs on a platter. This is absolutely the best pickled salmon you’ll ever eat in your life and a specialty of the house. The Smoked Salmon Tartare ain’t bad either. In regards to white fish, clearly Sturgeon is mandatory as is their combo of Whitefish & Baked Salmon Salad. For beginners, that’s a good place to start. Not a subject we’re confident discussing or something we buy often, however, review your options and let the guys behind the counter school you on what’s what. They like a good challenge. Some say it’s the best tuna salad in show. It’s certainly very good. Extra wet If you’re an aficionado, try and it judge for yourself. Basic, simple, sours and half sours. R&D’s pickles are on par with any other Jewish-deli style pickles we’ve ever eaten. Go hard. One of our favorite things to get at R&D’s, it’s hidden in a corner, so make sure you track some of it down. If you like cole slaw and like pickled cabbage, this is heaven. One of R&D’s main attractions is their selection of dried fruits, and for good reason. These trump even the ones that Fairway sells. Our favorite are the dried strawberries, that’s where its at. You like bread pudding? You’ll love bagel pudding. They chop up bagels and bake them with the sweetest of custards. You won’t be able to move after eating it, but it’s worth every artery clogging calorie.